Prisoner of the Bureaucracy - Thoughts From The Frontline - Investment Strategies, Analysis & Intelligence for Seasoned Investors. "Everyone knows the problems of Greece. There is no political will in the country (so far) to do what Ireland has done, and really cut their budget. 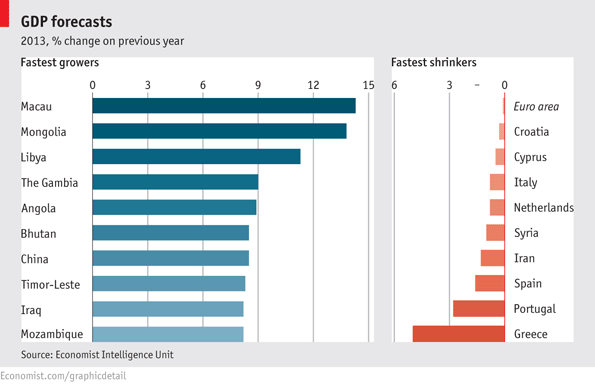 I think Spain is an even bigger nightmare for the EU when compared to relatively small Greece. Italy? Belgium? Portugal? All those countries (and their voters) will be watching to see how the EU deals with Greece." Which was good for Greece, as it gave good reason for the rest of Europe to care about what happened to Athens. Let's start with the conclusion: they have chosen to stay in the euro. If a depression meets your definition of an economic disaster, then it is reasonable to conclude that their choice has been a disaster. Greek GDP is projected to be down by 25% by the end of 2013, as measured from the beginning of the crisis. Exiting the euro at this time would only double the disaster. They must now finish what they began. As we will see next week, this may be the story all over Europe. The cost of breaking up the euro, or of a country leaving on its own, is simply now too high. For better or worse, the marriage must endure. Let's rewind the tape to see what I meant when I said that whatever Greece decided to do would be a disaster. At the beginning of the crisis, Greece was totally dependent on borrowed money both to finance its government spending and its massive trade imbalance in the private sector. While the cause of the crisis was too much debt and a deficit (both public and private) that was out of control, the immediate trigger was the loss of access to the bond market as interest rates rather quickly spiraled out of control. 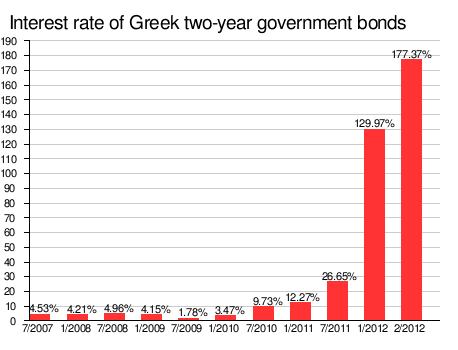 The second chart is Greek two-year debt. By this time last year interest rates had skyrocketed to 177.37% (and bond values had plunged!). The classic piece was the story written by Michael Lewis for Vanity Fair, delving into the systematic corruption of the tax system, among other national issues (more on which later). I have written about that article in this letter and quoted it here and in Endgame. It is a brilliant piece of narrative journalism. It became easy to dismiss Greece as a failed system. "Spain is not Greece," Prime Minister Rajoy told us in the midst of their own crisis. Indeed, we were told by leader after leader that their countries were not Greece, that somehow their crises were different and that helping them was not the same as helping Greece. We were greeted almost daily with the spectacle of riots and demonstrations, of political chaos. It seemed like the news was "all Greece, all the time." Was Greece going to be the first in a series of dominoes to fall as it exited the euro? Those of us who characterized the euro as an experiment and not yet a currency (as it had not gone through a crisis) saw even more reason to be skeptical of a currency union that existed without a fiscal union. The term "PIIGS" (Portugal, Italy, Ireland, Greece, and Spain) entered the vernacular as a euphemism for debt-ridden profligates. Writing that Greece had only a choice between two disasters was not being dismissive on my part. It was simply recognizing the cumulative effects of the failure to make difficult choices. 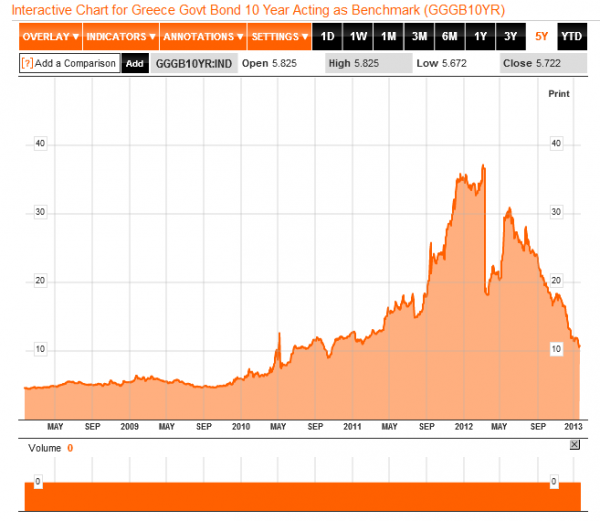 Once Greece lost access to the bond market, the game of borrow and spend was over. Since we know what happened as a result of Greece in the euro, let's undertake a thought experiment and imagine what Greece would look like if they had exited the euro. The "good news" is that the new drachma would have immediately dropped by 50%, thus eliminating almost overnight the trade imbalance, as any imports would require a "hard" currency (euros, dollars, pounds) and that money would only come from exports. Greece would have been plunged into an immediate and steep depression. While government workers would get paid in drachma, banks would have gone bankrupt and been forced into nationalization. Businesses that needed to import materials to make goods, either for local use or to turn into exports, would have been cash-starved. It would have been chaos. True, Greece could simply have walked away from their debt and then appealed for emergency and humanitarian aid from the IMF and others. But it would take time for any such institutional response to happen. At the time, I thought that Greece might indeed elect a government that would leave, because of the pain involved in staying. If you remember, there were several elections, keeping politicians throughout Europe on edge for months on end. It was close. Last year it took two elections to come up with a coalition government. In the end, a real majority of Greeks wanted to stay in the euro, whether they were politically left or right. A crisis-management coalition government emerged to try and figure a path out of the mess. And it has not been (and will not be) easy. Greece has been, is, and will be on financial life support for some time. That means money from the "Troika" (the IMF, the ECB, and the European Union). But that money has come with strings. It has meant a regimen of "austerity," otherwise known as living on a budget. As I have written about at length, the European banking system is a systemic disaster. The regulators ENCOURAGED (there is no graphic strong enough to express the outrageousness of such a design) their banks to buy government debt and allowed them to leverage that debt by up to 40 times. This was on the theory that no sovereign (European) government could actually default, so therefore there was no need to actually reserve capital against the possibility of a default. And if Greek (and Portuguese and Irish, etc.) debt returned a modest premium (2-3%) over German or French debt, then the spread was worth it to the bank managers and shareholders. After all, the regulators had said there was no risk; it was easy money. Even economists can figure out how to make money at a "modest spread" on 40 times leverage with no risk. Just ask those clever guys at Long Term Capital. And if the spread was 2%? Then back up the truck and give me some more. 100% on your capital per year with no risk? Where do I sign up? And thus the EU found itself in a credit crisis when Greek debt started to rise in risk, having already been decimated by the subprime crisis. Someone finally noticed that Greece could not hope to pay off its debt. However, German and French banks had so much Greek (and other peripheral-country) debt that if Greece defaulted they would be bankrupt. That would of course force the respective governments to capitalize their banks to keep their countries afloat. But then that would call into question their own credit worthiness as we are talking a great deal of money. And if Greece were allowed to default, then what would that imply about other peripheral-country debt? The word contagion slipped into the economic lexicon as Merkel and Sarkozy (and many other European leaders) openly worried that if Greece were allowed (or forced) to exit the euro, the entire euro experiment might be called into question. So the easy fix was to simply loan Greece the money to allow them enough to pay the banks until the loans were small enough that what remained could be written off. Of course, the loans from the Troika were considered sacred and have not yet been written down (more below). But private holders of Greek debt are down some 90% on a mark-to-market basis (as I predicted). And I may have been optimistic. We shall see. So, let's fast forward to my four days in Greece. I was in Europe for a series of speeches in Scandinavia for the Skagen Funds. I had to be in Geneva eight days later, so rather than return home to Dallas just to fly back again, I decided to stay in Europe. I had been writing about Greece for many years but had not visited, though I had corresponded with Greek readers during that time. So after Scandinavia I spent the weekend in the south of Spain, a day in London, and then flew on to Athens. I had asked my good friend Christian Menegatti, managing director and head of research at Roubini Global Economics, to come with me. Christian is Italian and married to a Greek wife (with a new baby!). Between the two of us, we stayed extraordinarily busy with meetings. We saw business leaders and entrepreneurs, politicians, economists, central bankers, and investors. And at night, neither of us being shy, we made a point of frequenting the tavernas and meeting the locals. Let's review a few quick facts, and then I'll share with you some of what I learned, starting with some anecdotes gleaned from those evening sojourns. Unemployment, I was told, is close to 27%, still rising, and could approach 30%. Youth unemployment is over 50%, and young people are leaving. Over €80 billion has left the banking system for other countries. Banks are basically depending on emergency Greek central bank lending in order to maintain liquidity. Theoretically, these loans will eventually be a debt of the Greek government. Greek banks are totally bankrupt, having had to take massive haircuts on their Greek debt. Banks that are considered "systemic" will be required to raise 10% of the money needed to recapitalize them, in order to get the 90% available from EU funds. Banks that are not considered systemic will simply be nationalized. This is a point we will revisit. That all sounds so grim. And indeed, there were reports of bombs being set off as I left the country. Apparently, no one was hurt. And there was a demonstration of sorts arranged for me on Saturday afternoon. They blocked the streets off in front of our hotel (the Grand Bretagne), which is on the plaza in front of the capital building. When you see pictures of Greek demonstrations, they are likely taken from the same vantage point we had. After experiencing a march with 700,000 protesters when I was in Buenos Aires last November, this seemed rather tame. Mostly it looked and sounded like a rock concert with bad music. I was told by the doorman that it was a protest by the "radical left" against the racism of the "radical right." "If no one shows up, then they will open the streets pretty soon." I waited, and when the only assault was upon my ears, I went back to my room. Christian and I ended up taking the same early-evening plane to Athens. We quickly parked our luggage and set out to find dinner, walking to an area that Christian knew. We sat outside, ordered some simple fare, and planned our next few days. Eventually the owner came by, noticed the odd accent (mine), and stopped to chat. When he found out we were trying to learn about the situation in Greece, he opened up. We peppered him with questions about business and his feel for the economy. How was he making it? It struck me as odd at the time that he emphasized several times that he had cut his overhead by going directly to local farms for his food (which was good). No middlemen for him! I wondered why you would wait until a crisis to source better and less expensive food, but I didn't ask. We shook hands and he started to walk away, and then on a whim I asked him what he thought about the new coalition government. Within a few minutes he was quite upset – not at us, though! He pointed animatedly in the direction of the capital, punching the air for emphasis, and exclaimed (without raising his voice too much), "They stole billions and put it in Swiss accounts and now they want to tax us more to pay for their theft. They're all the same!" The next night offered quite a contrast. In the evening we walked to the base of the Acropolis and found what looked like a promising venue and entered. It was early by Greek standards, but a performer was playing a guitar and singing Greek tunes to a table of six (ahem) older gentleman, clearly old friends eating and drinking together. (Later we found out they had been gathering once a month like this for 20 years.) As the evening went on and the wine kept flowing, they began to sing. A second guitar appeared. The aromatic cigars came out and were smoked directly beneath the no-smoking sign, with no sense of irony. One patrician gentleman stood a few times to have his picture taken with locals who dropped by that evening. The young owner of that tavern came by, and we started out as the night before, asking questions. When he found out what we were looking for, he went to the table and pulled one of the elderly gentlemen away and introduced us. It turned out that he was an economic journalist and chairman (emeritus) of a Greek journalism society. I quickly borrowed a pen and began to take notes on a paper placemat. He was an odd mixture of pessimism and hope, a perfect living metaphor for what I found from top to bottom in Greece. This was the best government he had seen in his life: "I trust this government." But when asked if he was optimistic, he shook his head wearily and said no. When we pressed him as to why – and we had heard variations on this throughout the trip – he said, "The government is the prisoner of the bureaucracy. We have 4,021 associations and 6,200 codes. You simply cannot change things. There are 600,000 tax elements. No one really knows who pays what." He continued: "Remember the spectacle a few years ago, when a new government came in and found massive debts and accounting irregularities? The blamed all the problems on the old government as they negotiated for new loans from the EU. Of course, the people they were blaming were bureaucrats they themselves had appointed, the last time they were in power. The government still to this day does not know how money is spent. They will try to change. But even if they pass new laws, under the rules a minister does not have to enforce them." Which brings us back to the comments by the first restaurant owner about cutting out middlemen. I asked one of my hosts (and got someone to confirm) that the rules are set up so that very few suppliers of a product get to compete. You buy your oil or produce from a very limited group of suppliers. Going direct is legal but evidently not all that easy. Is it the same in every business and industry? No, but enough to be an issue. One businessman told us that he has a factory in Germany and one in Greece. The one in Greece is just as productive as the one in Germany, but he needs five times the number of accountants and lawyers and clerks to deal with the system. This letter is getting long and I am only halfway through (but just getting going on Greece! ), so I will pen a second part next week, detailing my impressions from meetings with businesses and government officials, along with some new reports and quotes. But I don't want to end here without giving you some sense of my conclusions. I found guarded optimism in Greece that things can change, and from people that six months ago would have been deeply pessimistic. The source of that change, as we will see, is somewhat ironic. Greeks are natural entrepreneurs. As I noted a few weeks ago, it was the son of a Greek immigrant who pioneered horizontal drilling and fracking here in Texas. And new Greek businesses are sprouting everywhere. There is real potential for an upbeat finish to what was a disastrous beginning to this crisis. I heard time and time again, "If we can get through the next six months without real protests or …" More cuts are coming, and deep ones. Things must change, and there is a real constituency, especially in the bureaucracy, that does not want to see change, at least for their part of the world. But all that will have to wait for next week – just remember, what happens in Greece will not stay in Greece. As I noted three years ago, the rest of Europe is watching. This Greek song will be sung in tavernas and inns and bistros and gasthäuser and pubs and osteria all over Europe. The words will be different, but the tune will be the same. Sung by old men who wish for better times for their grandchildren. I leave Sunday for Toronto, where I will spend the evening discussing life and economics with good friend David Rosenberg, and then meet the next day with Rick Rule and the team at Sprott Investments. That evening I will be speaking for my Canadian partner, Nicola Wealth Management, at the Trump Hotel. I will be on the Suns News Network in the morning and guest host on BNN at 3 PM with Andrew Bell and Saijal Patel, old friends whom I have only met so far through the camera, so it will be fun to be with them live. The following day I fly to New York for some meetings and, I think, a spot early with Tom Keene on TV and then radio at 8 AM. Then a few more meetings and some media still being worked out, before I head off to Washington, DC to be with my good friend Newt Gingrich and have some meetings on the Hill the next day, before flying back to Dallas that evening. I am making plans to go to Argentina for two weeks in the middle of March. My friends and partners at Casey Research have built a magnificent resort in the north of the country (Salta Province), just outside the city of Cafayate. It is magical horse and wine country, set in the foothills of the Andes, with a year-round perfect climate. One of the best golf courses in South America (at least the longest! ), world-class spa and gym, and the wonderful Cafayate plaza at night. They do a semi-annual event for property owners and people who are interested in having a special getaway place. I will be spending most days there working on my latest book, getting in workouts and visiting the spa, and just taking in the beauty of the place. There will be evenings with friends Doug Casey, David Galland, Olivier Garret, Bill Bonner, and whoever else shows up. (This is one of the few places I go where I am the tolerated liberal; but these guys, being libertarian by nature, tolerate almost anyone as long as they are interesting.) I intend to spend more time there each year, I think. They still have a few spots open if you want to join me. You can check it out here. You can view photos of the area and the resort on the website; but realize that pictures don't capture how breathtaking this place is when seen live. And the ride to Cafayate through the canyon is simply not to be missed. Ed D'Agostino, the guy who really runs Mauldin Economics, wants me to note that they are looking for a few good marketing copywriters, who know the difference between marketing copy and the hype that sometimes gets associated with economic letters. You can contact him at [email protected]. It is time once again to hit the send button. That time in the Greek taverna with the elderly gents is a special memory for me. It was like a setting from Zorba the Greek. It is what we imagine Greece to be, so rich and fruitful and full of heart. Now I just need to figure out how to get to a Greek beach this summer!